What if unbundling school made it better? 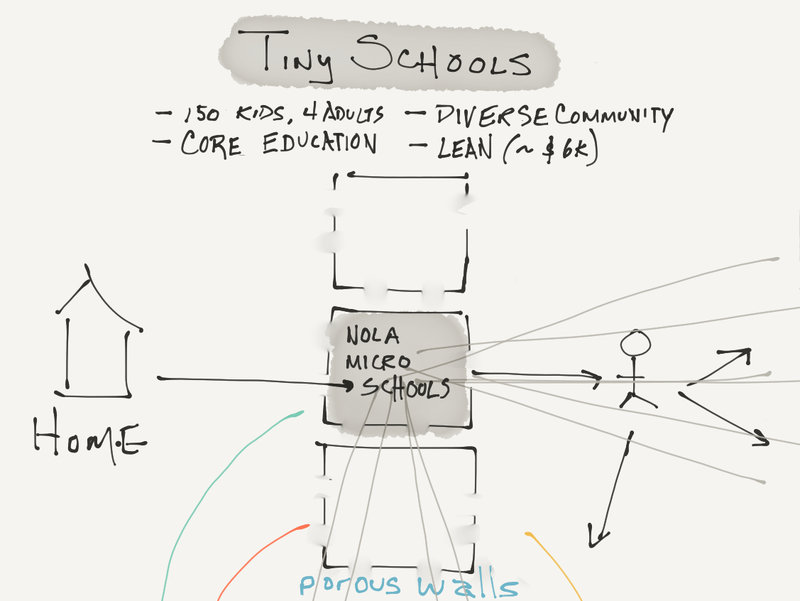 Today we roll out a new iteration of our advanced program for founders of schools and learning spaces — The Tiny Fellowship. It’s like the 4.0 Launch Fellowship and The Tiny Schools Project had a baby. You can read about it here: Tiny = Huge. This new approach allows us to support many more (10X) founders by helping them build a ten-student version of their school or startup without quitting their job. It also includes a challenge to the members of our community — let’s have the schools and startups we create work together to make school better, especially for students who don’t have options right now. We’re kickstarting that process by sharing a definitely-imperfect, but more-specific-than-ever vision of the future of school and challenging existing and new founders to riff on it. What if schools and learning spaces were small enough for every adult to know every child’s name? 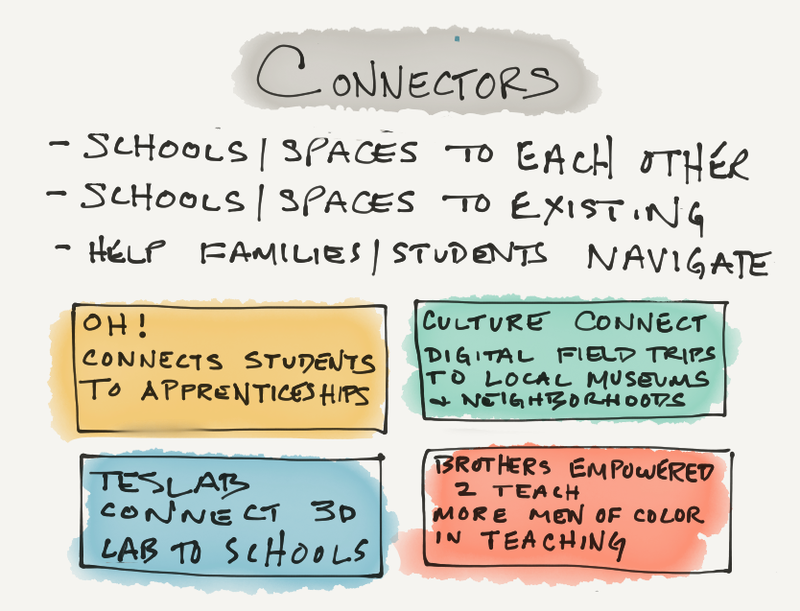 What if schools and learning spaces — both public and private — were intentionally diverse and brought families back together across the boundaries we adults make for ourselves — race, class, zip code to name a few? 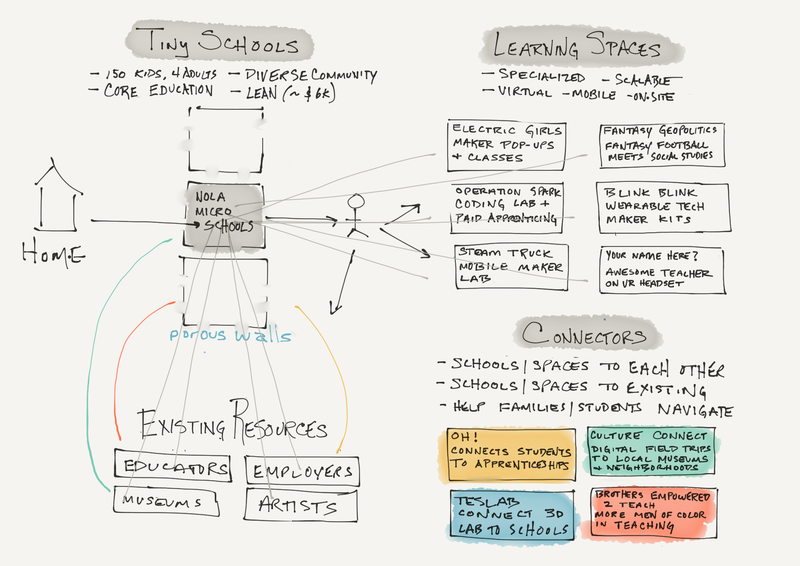 What if schools and learning spaces operated in a coordinated, safe, open-source ecosystem that gave every learner a diverse set of options at their individual level instead of just at the school-model level? What if we found a way to change this stat: 51% of $ in urban systems is spent before it hits the classroom? One way to get there is to thoughtfully unbundle how school works today. For 374 years, we’ve been passing laws about compulsory schooling in the US, bundling more and more things together in this thing called school. Some bundling is critical, like when we pass laws like Brown vs Board of Ed. When it comes to how we execute the very complex maneuver of educating a country, the same rules that apply to other complex markets apply here — healthy markets oscillate between bundling and unbundling (think of the system breathing) in search of ways to better serve the people in their care. 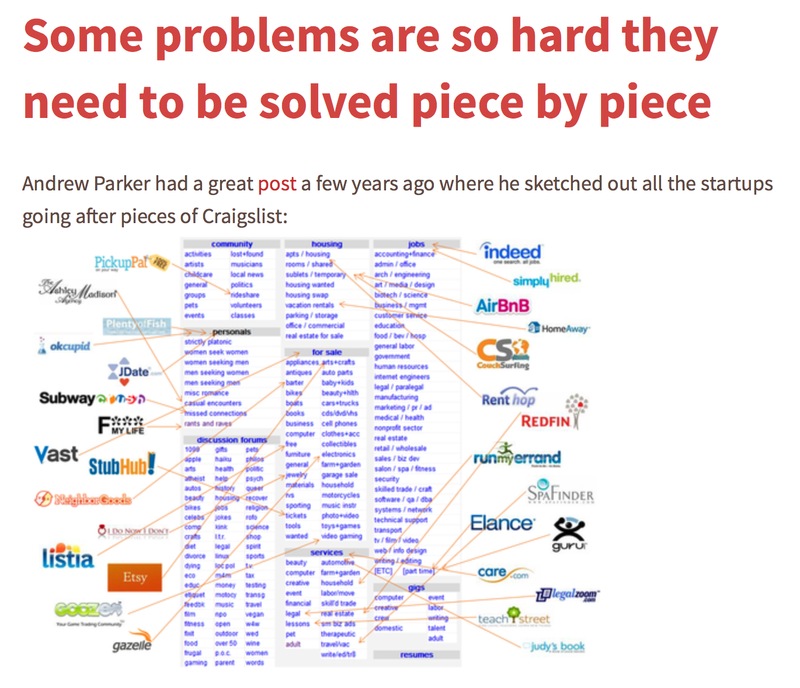 Chris Dixon’s great post on the unbundling of Craigslist. Silicon-Valley-metaphor-alert: We should absolutely approach unbundling a sacred public good like compulsory schooling differently than the entrepreneurs of Silicon Valley go about unbundling Craigslist. But if you’re asking my inner teacher, and my inner parent (kids=10,8,6), that big monolith of blue text on craigslist does remind me of the big monolith that school too often feels like. Tiny schools are much smaller than most, ideally no more than 150 students — roughly the number of relationships most humans can reliably maintain. Keeping a school under this means every adult in the school should know each student’s name. Tiny schools have porous walls that allow students to access specialized learning spaces and existing resources outside the building. Tiny schools have no middle management layer — they are considerably leaner than most schools, costing around $6k/student. They don’t solve the challenge of being all things to all students with more layers of administration, they solve it with the help of specialist partners (often off their own balance sheet, like here and here). Tiny schools serve families as the starting point for the school day and provide instruction in the core subjects, usually through a radically more student-centric pedagogy. Most families still need a school to care for their children during the day, and tiny schools provide that stability to families while relying on students to pass through their porous walls to access specialized learning spaces and external resources. Tiny schools can be private if they price in a way that lets families across the socio-economic spectrum participate. NOLA Micro Schools has a sliding scale, honor-system based approach to tuition where parents pay between $4k and $12k per student. Tiny schools can be public, too. Rooted School got their start as a pilot program within an existing charter school and will open under their own charter next year. We’re also working with a few visionary districts to roll out a system of tiny schools within their current system. 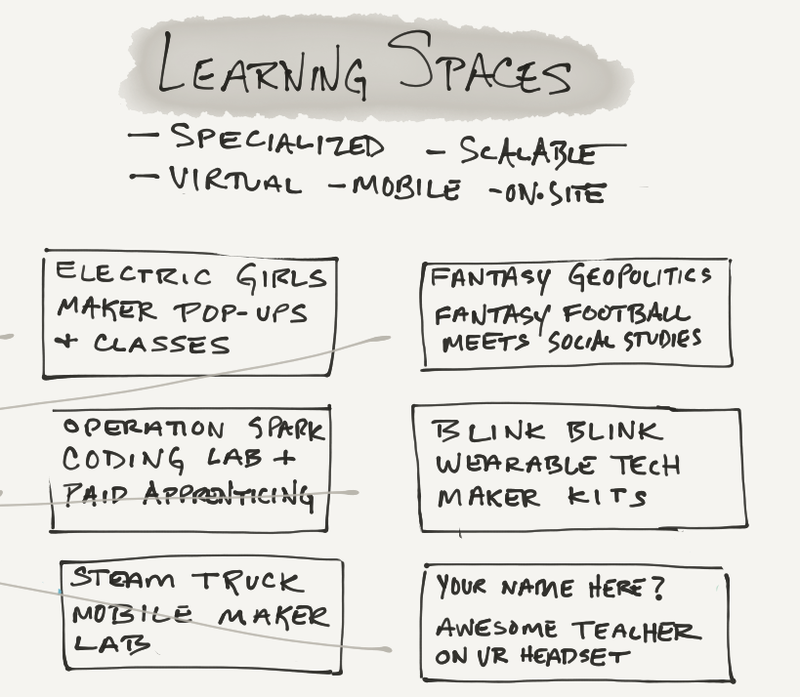 Learning spaces are more specialized than tiny schools. They provide far more choice and flexibility to families and students than whole school models can. They also give great educators a chance to serve more than the 20 or 30 kids in a classroom by letting them break free of the current model to serve students in more than one school. They give schools a chance to focus on building a community that understands each child while leveraging many more people than their full-time staff to serve a wide variety of student needs and interests. Learning spaces have the capacity to scale fast, serving many students and families (in existing schools or in homes right now, and over time, within ecosystems of tiny schools). A mix of delivery methods are emerging — on-site, in mobile platforms, and virtually (video chat now and over time, via Augmented reality). Trust, safety and ease of navigation are critical to this ecosystem, too. Parents and families need to know what their choices are and how this more unbundled system is working. Schools and learning spaces need tools to stay connected and share what students need in real time. They also need more robust connections to a wider, more flexible labor force. More people, bigger ideas, tinier tests. 4.0 Schools helps bold people test big ideas about the future of school with families and students who want to be involved in those tests. We’re a non-profit that strives to put students and families at the center of what we do, and we’re committed to diversifying leadership in education. To learn more about how you can get involved, please visit us at 4pt0.org, follow us at 4.0 Schools. Read more about what we’re doing right now at futureofschool.org. Thanks to 4.0 Schools and Austin Blouin Crouse. Stories from 4.0 Schools on making reform more human, investing earlier and more often, tiny schools and learning spaces, and opening up education innovation to everyone. 4pt0.org.